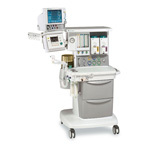 The GE Datex Ohmeda Aestiva 5’s breathing circuit is integrated to help simplify cable management and improve patient safety. Components are protected from damage and disconnection. Smart sensors and switches provide uninterrupted communication between the breathing circuit and the SmartVent ventilator. The Datex Ohmeda Aestiva 5 offers a unique combination of quality performance and cost-control. The 7100 ventilator provides a wide range of capabilities, including optimal tidal volume compensation and integrated volume and oxygen monitoring. Four display options with integrated monitor controls: 15" or 17" high resolution color video display and 10.4" or 15" flat panel color LCD display. Or large 17" color CRT display.